Temptation could not stop me today when I passed by the Sizzling Tandoor. The scents coming from this establishment have often been very enticing, but when the billboard advertising their butter chicken poutine ($6) hasn’t changed for weeks, today was the day I’d go in to try this tantalizing meal. I wasn’t disappointed. The fries were satisfyingly good but not super exceptional. If I were able to say supersize me, I would’ve had a meal. The serving was appetizer sized, just enough for lunch, and the amount of chicken piled on top was light. It balanced out the other flavours, like the lightly spiced curry-like gravy. But a poutine isn’t a poutine without a heapful of curds. 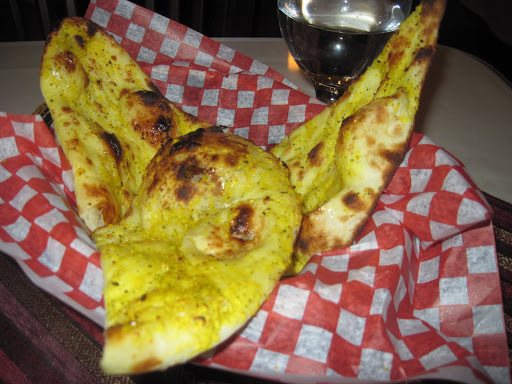 When I was here during the busy dinnertime rush, I had to supplement my snack with a serving of garlic naan ($3) and Kachumber Salad ($7). The bread was good, nicely warmed and crisped, with a bubbly texture that I enjoyed. It was almost like a sponge, but that’s just me noticing how it ripped apart when I used pieces to wipe up the gravy from my poutine. Interestingly, I could almost bounce my taste buds off it. I did taste the garlic oils and basil against the soft bread, but was disappointed to not find a whole lot of garlic to bait catfish with. A stronger flavour would’ve been great, but that’s just me. The salad stole the show. There was more than olive oil and lemon juice that brought out the simple flavours of my salad. The carrots and cucumbers were beautifully crisp, and the tomatoes were a reminder of what I loved before upgrading to eating heirlooms at home. Despite a hiccup in the service—I had to ask for a refill of water after my second cup—I’d certainly return to get a taste of the north. That’s the region of India where the food takes its’ inspiration from. After sampling a complimentary serving of a pappadum, now I know why Lister from Red Dwarf goes ape about them. I’d take these over the naans any day of the week, and eat them in troves. I’m glad this place offers extra sides of this cracker. They come at $2 per serving. When considering this place does a regular lunchtime buffet here, I’ll have to come back. If the menu choices from the non-buffet listing is not enticing enough for a regular sit-down, the variety here will. This entry was posted in Food, Reviews and tagged Dinner, French Fries, Lunch, Middle Eastern. Bookmark the permalink.